Use a Table or menu to quickly list out information on your slides. Tables can be useful for many columns. Menus can help show menu items. Easily add a Table or Menu to your slides to help list out items. 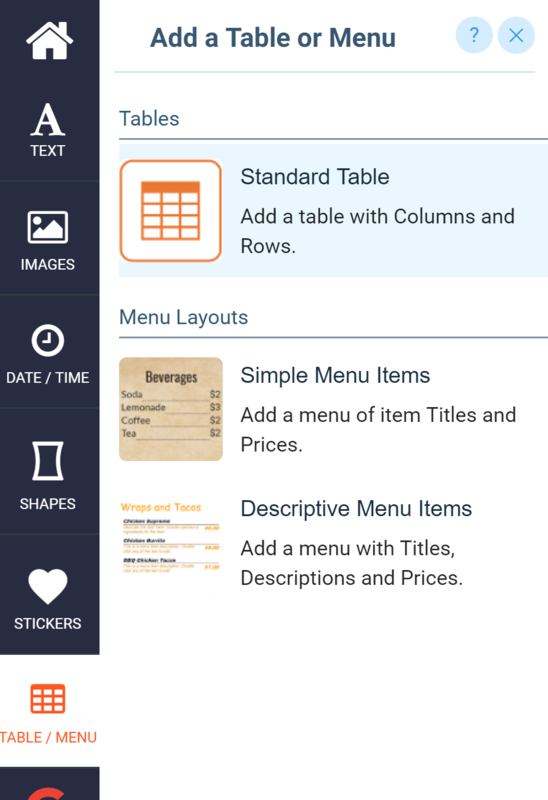 You can choose from a standard table, or a few different menu formats. A table can help you quickly list out items in a common format on your slides. To add a table, simply click the Standard Table button. This will insert a Table element on to your slides. 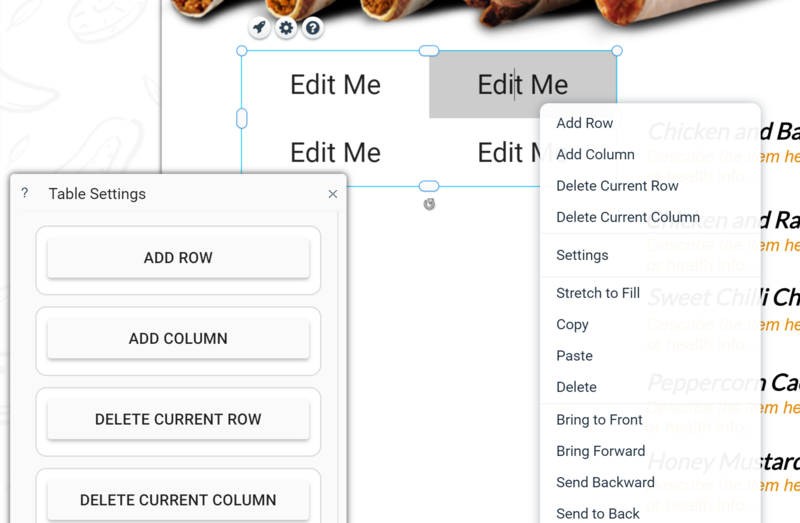 To add Row or Columns to your table, you can click the Settings "Gear" icon and choose Add Row or Column, or you can simply right click the Table element which will present the option to add a Column or Row. To edit the text in the column or row, simply double click on the text which will allow you to edit it. To delete a column or row, simply highlight the row or column you would like to delete and click Delete Current Row or Column. You can change the font appearance for your table by clicking on the Settings "Gear" icon and scrolling down to the font section. 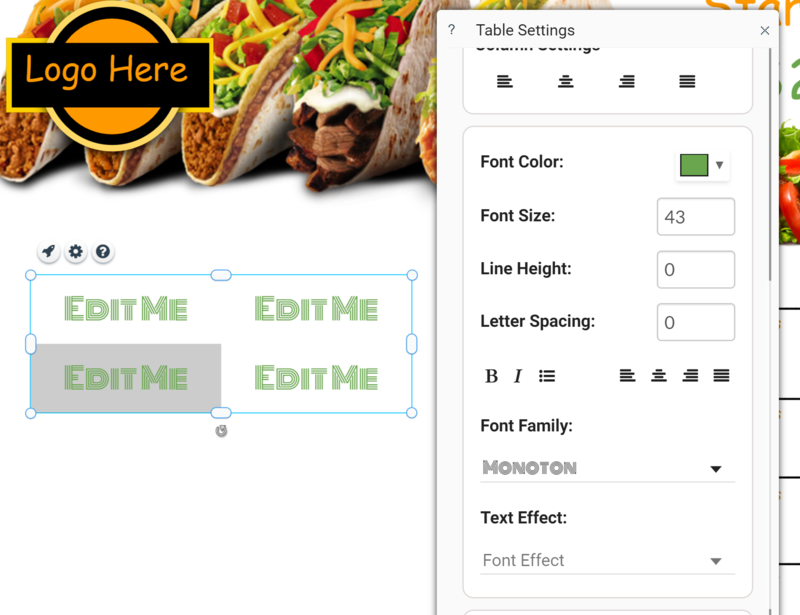 From here you can customize the font sizes, type color and more of your table. You can add Menu Items to your signs by clicking on the Table / Menu app, then selecting one of the Menu Layouts. 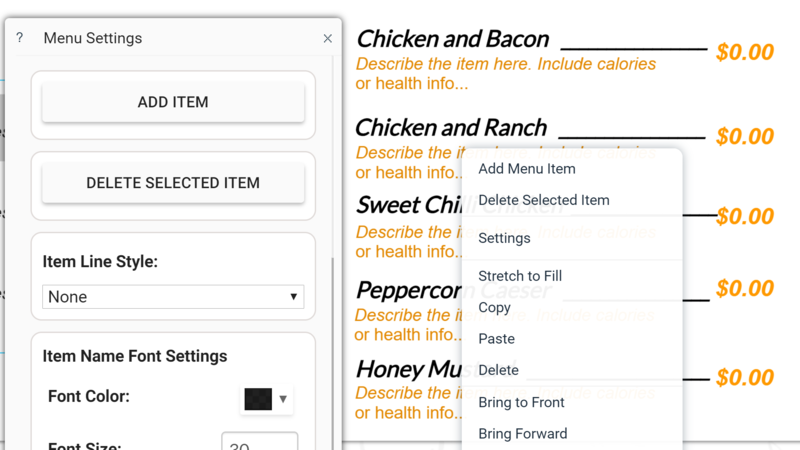 You can choose a Simple Menu layout, or a Descriptive Menu Layout. A simple menu layout will allow you to add item names as well as a price. You can choose to add the dot, spacer, or change them to dashes, solid line, or none. You can customize the fonts for the item names and prices in the Settings panel. To edit the text, simply double click on the name, or the price. 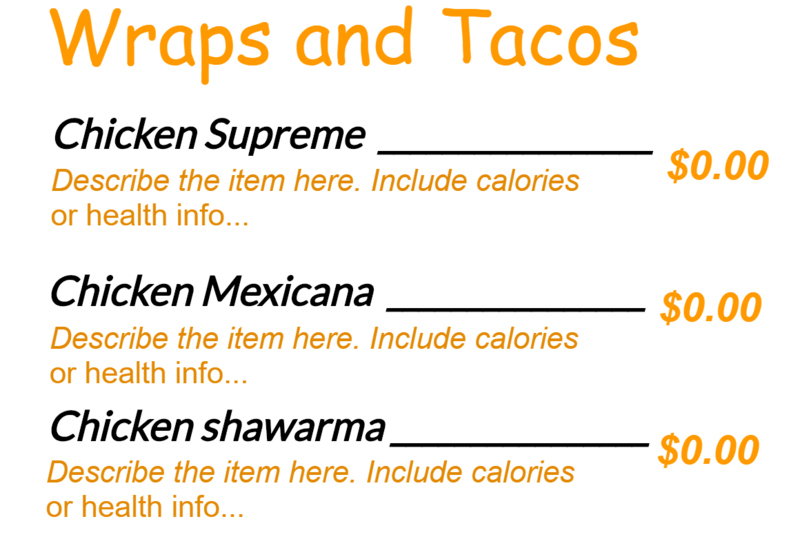 A descriptive menu layout allows you to specify item names as well as descriptions and prices. You can customize the fonts for the item names, as well as descriptions in the Settings panel. To edit the text, simply double click on the name, description, or price of the item you would like to edit. To add menu items you can click on the Settings "Gear" icon and add new items through the settings panel or context menu by right clicking the menu. You can remove items by highlighting the menu item and clicking "Delete Selected Item" in the settings panel or context menu. You can also change the format of the dotted lines by clicking on the Item Line Style in the Settings panel. This allows you to change the format from a dotted line, to a dash, solid line, or no line at all.